Home » BLOGCHAIN » Pura Coin » PURA News +++ New PURA Website Now Online! PURA News +++ New PURA Website Now Online! PURA Vida everyone! It has been quiet here on PURA social media. The reason for this is that the PURA team has been working on a new PURA website behind the scenes. And here it is – packed with information and a new and fresh layout! We hope you like the new PURA website as much as we do. Simultaneously, we are still in the midst of finishing up the final touches on the site. We will be featuring the best of our former PURA blog articles from the Blogchain on Facebook. As always, the complete range of articles is available directly on the website. Please make sure you spread the news and update all your bookmarks as well. Furthermore, we will be adding more articles on blockchain technology and innovation in due time. In line with this, we will also add other finishing touches to the website. Of course, you can still find everything you need to know to get started. We have structured the information on the new site in a more logical manner. 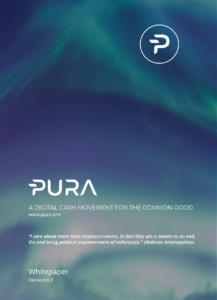 You can find the PURA Whitepaper here. You have been asking for a roadmap, here it is. We have updated the FAQ section as well. Also, if you have not done so visit our PURA shop to order your PURA merchandise. Let us know what you think of the site, we are happy to receive your feedback!